Zoom Presenter INSTANCE manager is an application bundled with Zoom Presenter to automate the creation and running of presentation instances. An instance is a running copy of Zoom Presenter. A Zoom Presenter instance is used for every monitor or screen zone presenting media or interactive content. For example, to display four unique screen zones within a single display device, define four Zoom Presenter instances. In a case where two display devices are connected, the first display device designated to present four screen zones and the second display device designated to present two screen zones, six Zoom Presenter instances are required. The maximum number of running Zoom Presenter instances is only limited by Hardware and Operating System limitations. 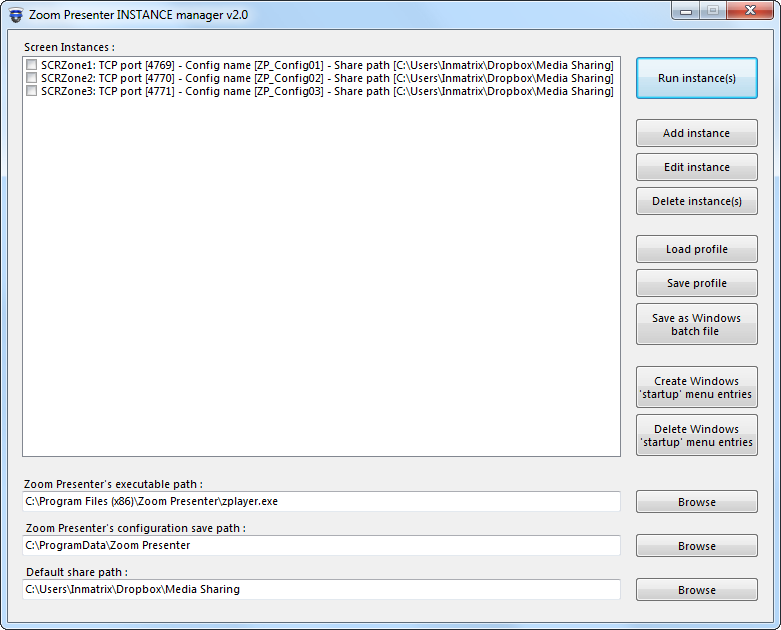 Once Zoom Presenter is Installed, run Zoom Presenter INSTANCE manager. The "Zoom Presenter's executable path" and "Zoom Presenter's configuration save path" fields indicate Zoom Presenter's installation folder, where Zoom Presenter saves configuration files. Both fields should be pre-filled automatically based on the values specified during Zoom Presenter's installation. If the "Zoom Presenter's executable path" field is empty, click the browse button and locate Zoom Presenter's 'zplayer.exe' executable file, typically residing in Zoom Presenter's installation folder. If the "Zoom Presenter's configuration save path" field is empty, select a folder where the current Windows user has write access, enabling Zoom Presenter to save its configuration file(s). Please note that recent versions of Windows prevent applications from saving files to the "Program Files" folder. The "Default share path" is the default folder used for the "Share Path" value when adding an instance (see below). Click the "Add instance" button to open the 'Instance / Zone Editor' dialog, as seen on the right. 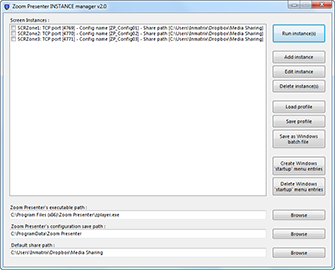 The screen instance name is used to more easily distinguish between multiple running Zoom Presenter instances. Each Zoom Presenter tray icon indicates a running Zoom Presenter instance. Hovering with the mouse cursor over the icon, shows the Screen name and other identifying information. The 'share path' is the folder in which all media content resides. The share path folder is made remotely accessible to Zoom Commander for the creation of playlists and presentation scheduling. Cloud Content Distribution services are ideal for synchronizing the 'Share Path' folder's media content across one or more PCs running Zoom Presenter. The configuration file name field is filled automatically with a unique configuration name. Each Zoom Presenter instance should use a unique configuration file to prevent conflicts with other Zoom Presenter instances running on the same PC. To control multiple, separate instances of Zoom Presenter running on the same PC, each instance must use a unique TCP port number, valid port numbers range from 1024 - 65535. Port numbers are filled in automatically by default. 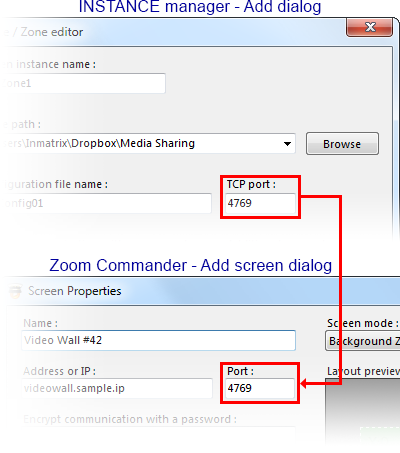 To associate a Zoom Presenter instance with a Zoom Commander screen entry, specify Zoom Presenter instance's TCP port number in Zoom Commander's Add Screen dialog, as seen in the example on the right. By specifying a password in the instance manager and specifying the same password within Zoom Commander's screen editor, the communication between the Zoom Presenter instance and Zoom Commander is encrypted, preventing 3rd parties from attempting to take control of the remote screen. The Additional parameters field is used to pass custom command line parameters to Zoom Presenter. For more information on the available command line parameters, click here. To run Zoom Presenter instances, select an Instance entry using the mouse or select multiple instance entries using the check-box to the left of the instance name or right-click the instance list and select 'all instances'. Once the desired instances are selected, click the 'Run instance(s)' button. Creating Windows startup menu entries. Clicking the 'Create Windows startup menu entries' button creates a Windows shortcut for each of the selected instances in Window's startup menu, automatically running each time Windows boots. Creating a Windows batch file. Clicking the 'Save as Windows batch file button' creates an executable Windows batch file script that automatically runs the selected instances. Please note that Windows batch files do not accept unicode command line parameters, preventing use of non-english characters in any of the text elements used by a Zoom Presenter instance (screen name, share path, configuration name, etc). To edit an instance, double click the screen instance entry or select the entry and click the 'Edit instance' button. Please note that editing an instance does not affect previously created Windows startup menu entries, Windows batch files or saved profiles. Each Zoom Presenter instance is represented as an icon in the Windows Task Bar's tray area. To close an instance, right-click its tray icon and select the 'Exit Player' option. By hovering the mouse cursor over Zoom Presenter's tray icon, the screen name and other identifying information appear to help identify each instance. Profiles are a set of Zoom Presenter instance entries saved to or loaded from a file. To save a new profile file, select one or more instance entries and click the 'Save profile' button. When loading profile files, a prompt asking to clear the existing screen instances pops up. Selecting 'OK' replaces the existing screen instances list with the content of the profile file. Selecting 'Cancel' appends the content of the profile file to the existing screen instances list.